It's not eternally binding....not when a later mutual agreement might end it...or change circumstances etc. All this is general...not necessarily specific/relevant to the case in hand. This License Agreement shall continue in effect with respect to the sale, licensing and sub-licensing of each Work, Derivative Work and Derivative Product, for as long as such Work, Derivative Work and Derivative Product are generating royalties to the Developer at least of $1000 per annum. Like the 'R' on the box-art. Why does a printed box make something fact? It seems that generally speaking, P and F's proponents really WANT to justify, and be seen to be justifying what really is unsupportable, such as the issuing of a DMCA notice when it is absolutely definite that P and F do NOT KNOW they have a legal right to as THAT court case is still pending. You cannot issue a DMCA unless you KNOW you own something....not just simply THINK you do. The 1988 agreement being in effect or not being in effect is irrelevant to this discussion. They have nothing to do with Star Control: Origins. They have no rights to it. Frankly, I think it’s pretty gross to see Paul and Fred’s fans spinning their awful behavior into unrelated arguments. If they they had any ethical or moral compass whatsoever they would acknowledge that DMCAing Origins on Steam for the reasons they publicly stated was despicable. If you are rooting for a result that would, in effect, allow game designers to own IDEAS then you’re, at best, a fool. you’re, at best, a fool. 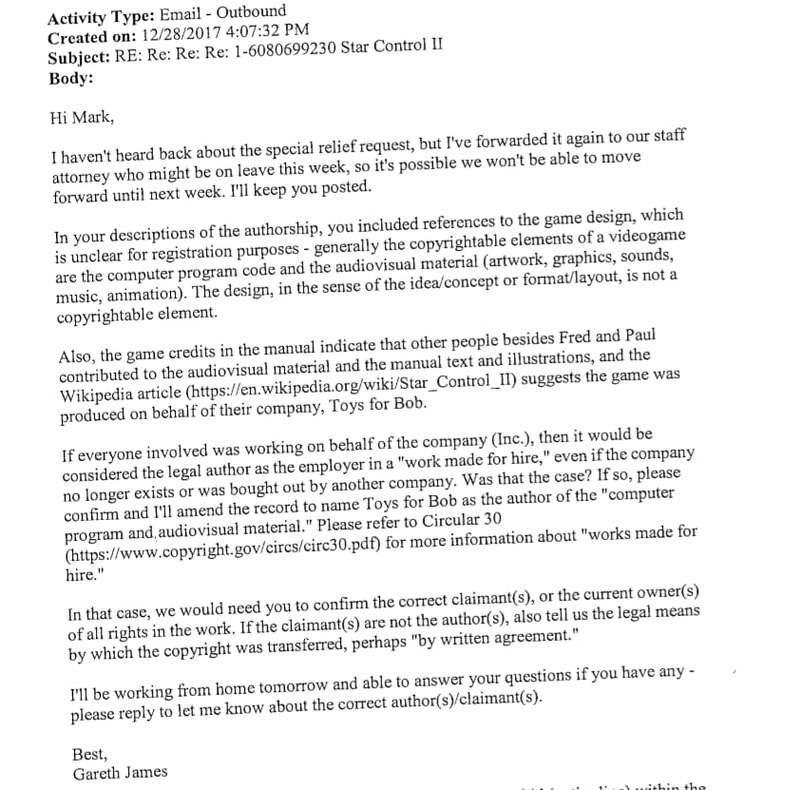 tingkagol's not hostile, but he believed P&F's PR firm's lies that the Stardock's lawsuit was a copyright lawsuit too. The Stardock Q&A refutes that ("Stardock's attorneys file a suit against Paul and Fred for trademark infringement and other causes of action. (December)"). I have told people that they should read the Stardock Q&A and at this point I have to believe tingkagol hasn't. That sounds foolish to me. If they were granting an exclusive license yes, if they were just granting a license to publish with the option of granting other licenses to other publishers, why not? I have said it before, and i'll say it again, only the lawyers will win in this very messy, unneeded mess. Based on the American legal system, I am sure it will take a couple of years to come to a conclusion, so i'll just wait for that while I enjoy Star Control: Origins. I think us Star Fleet people like the idea of owning ideas... that means ADB gets to sue like 1/3 of the people in the world of gaming today. I bet he'd be nice enough to give his staff a cut if he came into THAT much money for his games. Heck, I would deserve it over anything based on some of the "new" Andromedan rules that were mine... like leak damage going to hull before the DAC... that's the modern way of doing "armor" in games!!! How much do I get for that? Ron Spitzer did "modular ship designs"... how much does he get? Which one of us gets more? His thing is bigger in SFB but mine, the modern way of doing armor in games, is EVERYWHERE today! So I bet I get more than Ron, right? Can you imagine how much Paramount would owe Josh Spencer for the Xindi? Of course, Josh would also owe Wendy O' Williams a little for the Plasmatic Pulsar Device... but Josh would still come out way ahead on that one! Just let it go, Paul & Fred, just look at how much we don't get the credit for and never will... I really did "invent" the modern way of doing armor in games. Josh really did "invent" the Xindi of ST: Enterprise. DMCA is broken and P&F abused it. I think that makes it harder for people like Kavik too. In the absence of evidence to the contrary, it is indeed a reasonable assumption that a contract entered in to court proceedings as evidence is both true and absolute. Obviously, if the other party had offered ANY evidence or documentation to the contrary, this changes, but thus far the court records contain zero documents that would contradict the notion that the 1988 agreement is the correct document to use for resolving this issue. Furthermore, Atari/Accolade's own behavior, as documented in multiple email chains involving numerous employees, all fully supports and aligns with the common reading of those documents. If you have some SPECIFIC objection to the evidence, you're welcome to raise it - I'm not shy about linking to my own sources, but you seem awfully evasive about yours. No one is claiming you can copyright "the color red" or "the concept of hyperspace". What has been said is that you can copyright "a particular expression of hyperspace which is a red space filled with swirling lights and holes that allow you to see in to nearby star systems." The industry doesn't suffer just because the next person to come along needs to make their hyperspace green with strange cubic shapes instead. Indeed, for 25 years, the industry has been finding new expressions and avoiding stepping on toes. Hyperspace is also just one example of infringement. SC:O advertised the inclusion of copyrighted characters from the original P&F games (the Arilou, Chenjesu, and Melnorme), and used art from the original games in it's marketing materials. This isn't a situation that presents any sort of "chilling effect" on the industry at large - just on companies that try to tow the line by copying both visual appearance, and repeatedly advertise potentially infringing content. "The court found that Street Fighter II was itself based on stereotypical characters (scènes à faire) and hundreds of fighting techniques that were already part of the public domain before Capcom appropriated them for Street Fighter II and were thus not copyrightable." That's important when you claim SCO is copying Arilou. They are not. They made the Observers a different grey alien. "a particular expression of hyperspace which is a red space filled with swirling lights and holes that allow you to see in to nearby star systems. Well you have to show nearby star systems somehow, that's not really fair especially since in SCO the star systems include planets and SC2 only had a star in a black dot. The Arilou screenshot you may be referring to was a boxart for the music remix DLC and Riku owns the copyright to the music so a remix is allowed. Stardock applied for the Arilou and Chenjesu trademarks and if that's accepted then they can call it an Arilou remix. The Arilou in game were renamed the Observers, kept extremely vague, and redrawn to be a different type of the grey alien trope that P&F did not invent. The Chenjesu and their boxart were only part of a music remix DLC. I don't really know how to judge one way or the other about them still being blue crystals though, but I don't have sympathy for P&F on this because they went overboard and wanted Stardock to police community fanart. The Melnorme were renamed to the Maelnum and redrawn, and also kept vague. The only four similarities between the Maelnum and the Melnorme are they are orange, spies, you can sell lifeforms to them, and you can buy flagship modules from them. Two out of those (selling lifeforms and buying upgrades) four are common vendor tropes so in this case your argument is hanging by one or two fingers (orange spies). If you owned the trademark to Galactic Civilizations then no, I wouldn't be upset. And I could make the case that most every modern space 4X is a "copy" of Galactic Civilizations if I was so inclined. 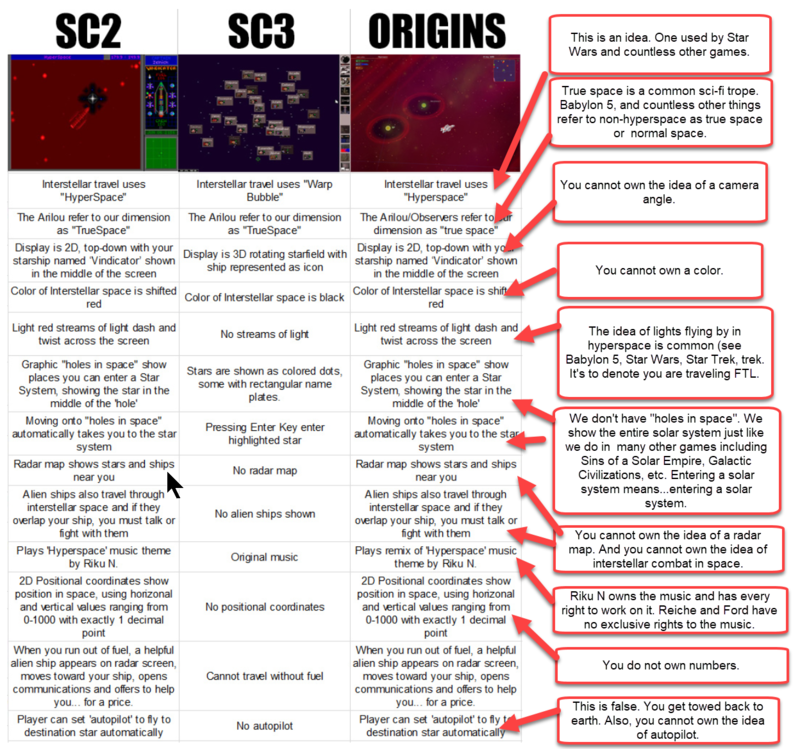 Moreover, the species in Star Control: origins aren't slightly different than the ones in SC2. They're totally different. I can tell you for a fact that none of the species in SCO were modeled after anything in SC2. Even the Observers, who are the generic grey alien trope, are not modeled after the Arilou in either looks or how they behave. There are no copyrighted characters in SC2. What are you talking about? There is source code and there is some art. And even if there were copyrighted characters in SC2, none of them appear in SCO. There are no copyrighted characters in SC2. What are you talking about? There is source code and there is some art. Yet again people get confused whether or not computer game lore can be copyrighted, or just the source code and art. Yet again people get confused whether or not computer game lore can be copyrighted. Indeed. There are well understood requirements to copyright a character. Batman, James Bond, Harry Potter, Rocky, are well defined characters. It would be very, very difficult to argue that any of the characters in SC2 are defined well enough to meet the copyright requirement. And again, even if they did, none of them appear in SCO. Even as-is, there are characters or even species that I'd say are defined well enough that I would expect Stardock to license them. For example, the way the Orz were expressed in SC2 not just visually (which is protected by copyright) but also how they spoke is sufficiently distinct that we wouldn't include them in an SCO game without getting permission. But nothing stops us from having a species called Orz in our games because we have a strong claim to the trademark. Nevertheless, we didn't include them because, contrary to some of Paul and Fred's more rabid fans, as creators (I've made more games than Paul and Fred) we don't want to use stuff that we think others have a moral claim on even if Paul and Fred obviously believe they have a moral claim on other people's creations which seems to be a pattern with them. Lawyerbabble. I can respond with technobabble, but the discussion will get very confusing. Stardock bought the trademark name "Star Control" and is using that name. Not Paul & Fred's story and they are not continuing the story. The gameplay is ours, not Paul & Fred's, and we don't mind if they use it. Just like we didn't mind when everyone else, including Paul & Fred, used it. Welcome back to reality, Mr. Lawyerbabble. This was the real answer, would you like a technobabble response too your lawyerbabble and we can just confuse the hell out of everyone? You are describing Babylon 5 hyperspace PERFECTLY!!! Did B5 also steal it from Paul & Fred? Or maybe you just never knew how hyperspace functioned and you think that Paul & Fred made up their visual expression of it out of nowhere? There is no "hyperspace infringement", that is how hyperspace works, what it is, and what it looks like. You are 100% lawyer and 0% gamer/sci-fi fan, aren't you? it is indeed a reasonable assumption that a contract entered in to court proceedings as evidence is both true and absolute. By 'absolute' I meant that it exists totally within a vacuum....nothing preceding or succeeding it historically. It really won't be as circumstances have evolved over 25 years. In reality It's nothing more than a piece of paper. When interested and/or opposing parties agree it is legitimate, relevant...printed on pink toilet paper...whatever...only then does it have any pertinence. Paul & Fred should not allow it to go to court. They should reach an agreement where Stardock owns the Star Control name they bought and P&F are free to continue and complete their own story through as many games as they want to do that... maybe under the title "Ghosts of the Precursors". Maybe Stardock would be willing to license them back the "Star Control" name under certain conditions, and P&F could complete their story under a title like "Star Control Prime: Ghosts of the Precursors" or something like that. There is a way to do this without lawyers and judges and all it takes is for Paul & Fred to stop thinking of our game as their game. WOW is not D&D and they are not the SFU. Hmmm.... "Star Control Prime" and "Star Control Origins"... I actually like that a lot! How about Paul & Fred & Brad? Paul & Fred... you get to be the "Prime" Star Control, because that is what you are. Brad & Stardock... you get the gaming media acknowledging your "grace" in giving P&F the "Prime" title while you go with your own "New Origins" universe of Star Control. The original story and probably more traditional, and more simple, gameplay is in "Prime", the more modern game is in "Origins". "Prime" has the original story and its continuation, "Origins" has the re-booted story of the new universe. It's obvious from the "Prime" and "Origins" titles who is who, and everyone knows that it all comes through Stardock who owns the "Star Control" name. Isn't something close too this something that all parties could agree too... especially since, in reality, it's Steve Cole's game. EDIT: My father the diplomat seems to have temporarily inhabited me, haha!!! Also notice that this is kind of like Star Trek today, split between Paramount & CBS... but also not in many ways. P&F ARE the original creators of the Star Control story/universe so them taking command of the "Prime" line is correct, unlike current Star Trek where Gene Roddenberry would need to be alive to do that. Stardock would be running free with their own re-boot, but this isn't Star Trek. Nobody is out their being a stickler for them to stick too the "Prime" story... in fact in this case the audience is WANTING a completely different thing than what P&F are doing. I think this is what works best for everyone involved, and ends the situation today if everyone liked something close too this. Hopefully this is a starting point that can lead too something that everyone involved likes. This is a silly and annoying argument to us SFU people, who are the actual "creators" of all of this and this entire genre. ...and EVERYBODY gets the goodwill and appreciation of the entire gaming world from working it out yourselves in the end, as "friends", rather than needing a judge's order to resolve the issue between "enemies". And then you get the reputation and publicity of all of this, and the Star Trek-like resolution too the battle over the name. This kind of puts everyone on the edges of their seats too see what happens next with this obviously beloved franchise from the earliest days of computer games... right? You both have a big chance at that moment too become the "Star Trek of the Gaming World"... that is the stage this sets. It would all depend on the next games you made... "Star Control Prime: Ghosts of the Precursors" and whatever Stardock decided to go with... maybe a strategy wargame so it is not the same genre as what P&F do. I'll even add myself too the deal, haha, I will make a Charles S Roberts/Stephen V Cole inspired strategy wargame in space for Stardock that will blow the minds of the gaming world... leaving just Paul & Fred to do their half in bringing the Star Control franchise raging back to the forefront of the gaming world and giving myself an actual target for my own PDU to then shoot down, haha!